Income support under PM-Kisan is only one small step. 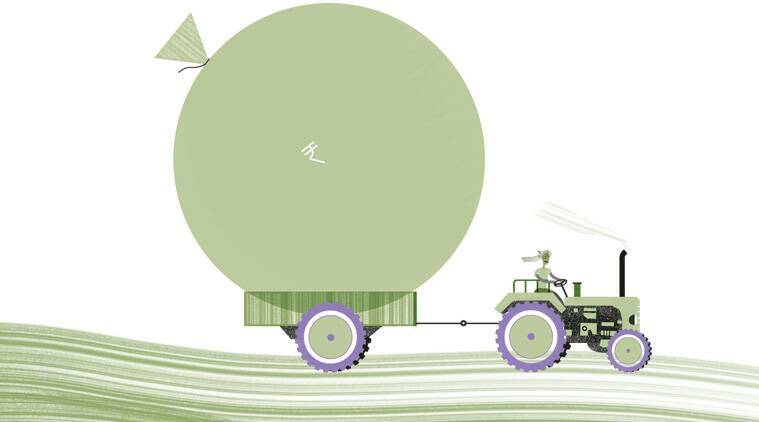 It must be complemented by large-scale reforms in agri-marketing and trade policies. Ritika Juneja is Research Assistant at ICRIER. Just ahead of the announcement of the 2019 general election dates, the prime minister launched the centrally sponsored ‘Pradhan Mantri Kisan Samman Nidhi’ (PM-Kisan) scheme of Rs 75,000 crore for small and marginal farm families. On February 24, from Gorakhpur in Uttar Pradesh, he transferred the first instalment of Rs 2,000 each (out of Rs 6,000 per annum) into the bank accounts of 1.01 crore farm families, amounting to Rs 2,021 crore. By March 9, 2.6 crore farm families had been given Rs 5,215 crore. The target is to cover about 12.6 crore beneficiary farm families by the end of March 2019. Although the amount involved per family is too little, and coming too late, yet direct income support (DIS) marks the beginning of a new policy direction. It can reach about 86 per cent of farm families compared to loan waivers that can benefit a maximum of 30 per cent of the peasantry and higher MSP policy which can benefit a maximum of 10-15 per cent of peasantry. However, at this stage one does not know whether this PM-Kisan is just for one year or likely to continue for the next few years. If it is just for one year, it is more a bait for votes than a genuine step towards improving incentives for farmers in a more predictable and structured manner. Similar moves towards DIS for farmers have been made by a number of states, especially Telangana (Rythu Bandhu scheme), Odisha (KALIA scheme), West Bengal (Krishak Bandhu), and Jharkhand (Krishak Aashirwad Yojana). Each one has its pros and cons, and can be improvised in due course. But we welcome all these, especially if they continue for at least three years to alleviate farm distress. In any case, it may be worth pointing out that such a policy of DIS is not a substitute, but a complement, to agri-marketing reforms on the one hand, and raising investments in agriculture on the other, to make Indian agriculture more productive, competitive, inclusive, and sustainable. One of the key variables that influences the performance of any sector in the medium to long term is investments and capital formation in that sector. 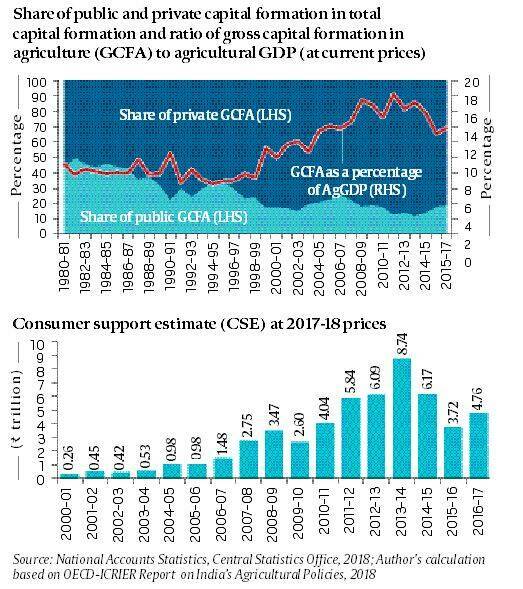 Graph-1 suggests that gross capital formation (public plus private) in agriculture, forestry and fishing (GCFA) as a percentage of agri-GDP (in current prices) dropped to the lowest level of 6.6 per cent in 1994-95, but gradually increased thereafter, touching a peak of 18.2 per cent in 2011-12. Thereafter it started declining and stood at 13.8 per cent in 2016-17. With incremental capital output ratio (ICOR) hovering around 4:1, this level of investment cannot give more than 3 to 3.5 per cent growth rate in agriculture, and can never double farmers’ incomes by 2022-23, an ambitious target set by the prime minister. Another interesting fact that Graph-1 shows is that of the total capital formation in agriculture: The share of public investments has gradually declined from 43.2 per cent in 1980-81 to 18.8 per cent in 2016-17 at current prices, and consequently, the share of private sector investments in agriculture has risen. While the share of private investments in agriculture is overwhelming (81 per cent), they need the right incentives to go up further as a percentage of agri-GDP. This is critical if the annual growth rate in agri-GDP is to be put on a sustainable trajectory of four per cent plus range. The incentive structure in Indian agriculture, however, is perverse. For the triennium ending 2016-17, the Producer Support Estimate (PSE), a measure that captures farmers’ incentives from output price front as well as budgetary allocations for input subsidies or any income support, was negative to the tune of 6.4 per cent of gross farm receipts. In contrast, China and OECD countries had PSEs of 15.5 per cent and 26 per cent respectively, as per OECD estimates released in 2018. Looking at these figures, it appears that the income support of Rs 75,000 crore that the PM has announced under the PM-Kisan scheme is only a small step to improve incentives for farmers. A more sustainable solution will be to carry out large-scale reforms in agri-marketing and trade policies, along the lines of GST with states, and, incentivising the private sector to build more efficient and inclusive value chains for agri-commodities from the farm gate to the consumer end. The first step in that direction will be to change the policy mindset, and eliminate the inbuilt consumer bias in our food and agri-policies. This requires stopping of subsidies to consumers by suppressing food prices through archaic laws of the 1950s (such as the Essential Commodities Act, 1955). As per OECD, the Consumer Support Estimate (CSE) for India for the period 2000-01 to 2016-17 is about Rs 3.13 trillion (lakh crore) per annum at 2017-18 prices. About 81 per cent of this comes from farmers who cannot realise the best prices for their produce due to restrictive trade and marketing policies (Graph-2). Further, the food subsidies of Rs 1,84,220 crore as provisioned in the current budget (plus a minimum of Rs 1,20,000 crore of pending FCI bills) need to be revisited to target it to the bottom 20-25 per cent of the population, rather than providing 90 per cent subsidy to 67 per cent of the population. This would then provide a level playing field to farmers, improve their incentives and propel private investments in agriculture — it would be a step towards augmenting farmers’ incomes on a sustainable basis. The investments need not be restricted to just augmenting agricultural production but also fixing its marketing infrastructure, logistics, as well as linking production by farmers’ groups to organised processing and retailing, with a view to minimise market risks, save wastages, and augment farmers’ price realisation.